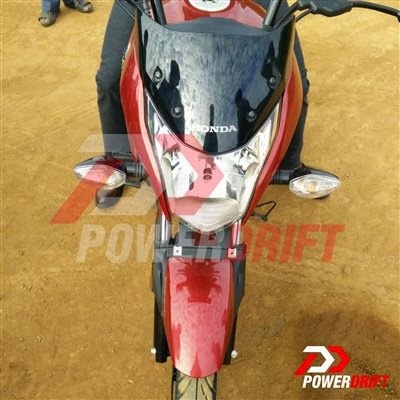 Honda CB Unicorn 160 which is expected to be the successor to CB Trigger has been spied during its Television commercial shoot. The CB Unicorn 160 will compete with Yamaha FZ FI V2.0, Suzuki Gixxer, TVS Apache RTR and Hero Xtreme Sport in India’s 150 to 200 cc motorcycle segment. The front end of the vehicle bears a sharp styling with fuel tank being more or the same as that of its competitors. The seats are long enough to seat two people in good comfortability. There is a styling sari guard with some plastic inserts. The motorcycle will feature a fully digital instrument console. The 160cc engine is the new single cylinder air-cooled one and is likely to have traditional carburettor as there is no visible ‘PG-FI’ sticker on the spied motorcycle. The engine develops power output of 15-16 Bhp. The bike has the familiar telescopic fort in the front and monoshock in the rear as suspension setups. Break systems include a standard front disc and an optional rear disc. While Yamaha FZ FI2.0 and Suzuki Gixxer bet on the muscular looks, the CB Unicorn 160 will rely on the comfort and cost. The CB Unicorn 160 will be launched in early 2015 and is expected to be priced between Rs. 70,000 to 80,000.